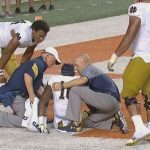 Notre Dame’s Torii Hunter, Jr. after hit in Texas game. It’s an image etched in the consciousness of Notre Dame fans watching the 2016 season opener at Texas. 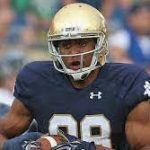 Senior co-captain Torii Hunter Jr. is prone in the end zone, his arms occasionally flailing, while a coterie of teammates and athletic trainers attend to him. Moments later, the camera picks up his dad, baseball great Torii Hunter Sr., mom and other family members, as they are ushered onto the field en route to the Notre Dame locker room. Concussions ended Corey Robinson’s playing days. The diagnosis: concussion, the scourge of modern football. Another famous Notre Dame football father, basketball Hall of Famer David Robinson, watched his son Corey sustain multiple concussions before deciding to hang up his football cleats going into this season. That game today stirs the interest of more millions of Americans then ever, some of whom are concerned about its future, given the research that shows the development of cognitive difficulties from repeated blows to the head. Football Hall of Famers Terry Bradshaw and Mike Ditka are among those who, knowing what they now know, say they would not let a family member begin football. Across the nation, parents are faced with the dilemma: do I let my son play football? Meanwhile, more study than ever is going into the diagnosis, treatment, and affects of concussions. Among the most active institutions at the collegiate level is this week’s Notre Dame opponent, Michigan State University. 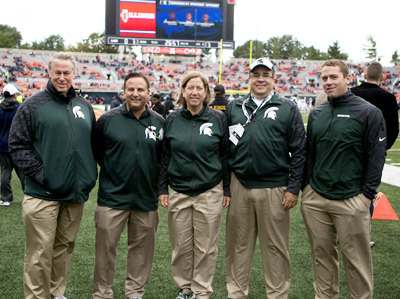 The MSU concussion team includes Dr. David Kaufman, D.O., left. For Spartan football games the past five seasons, a constant presence on the sideline has been the chairman of MSU’s Department of Neurology & Ophthalmology, David Kaufman, D.O. In addition to games, Dr. Kaufman is present at Spartan practices on Tuesdays (contact) and Thursdays (medical clearance of players) and medical treatment on Sundays. Dr. Kaufman praised the advances made in preventing concussions, including the strict enforcement of ‘targeting’ the head and neck; the teaching of ‘rugby-style’ tackling; the decrease in full-contact practice from twice to once a week (or its outright elimination, as in the Ivy League); and a new program being rolled out by the NCAA and the Department of Defense, at the service academies and a few other schools, to educate student-athletes to speak up…about their own concussion symptoms, as well as those of their teammates. MSU researchers have designed an all-sport, all-weather low-tech headband which detects the force of impact to the head. It can be imbedded in a football helmet, but otherwise worn as a normal headband in sports such as soccer. Michigan State’s concussion team is part of a joint effort with several other Big 10 schools, including Ohio State, Nebraska, Northwestern, Penn State and Purdue, along with the University of South Florida. Dr. Kaufman remains one of the few team neurologists on the sidelines in college football; this 2013 New York Times article profiled Dr. Kaufman and his counterpart at MSU’s arch-rival, the University of Michigan. What is Dr. Kaufman’s advice to parents of prospective athletes? “I advise people to use common sense,” he noted. “Assess each activity in terms of risk and benefit. And we know the very positive aspects of team sport – learning how to work as a group, learning how to win and lose, how to persist in achieving a goal. Weigh all that vs. the potential dangers. Know that there is emerging science that is changing some sports. The call for limiting ‘headers’ at the younger levels of soccer, for instance. Dr. Kaufman sees the work of his colleagues at MSU, and other universities, to be critical in the future of football and other contact sports.